We hope you will come and join us! 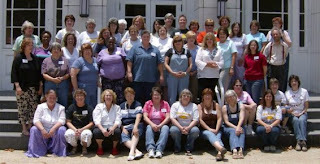 The 11th annual Alabama Soap Meeting will be held at the Doster Center in Historic Downtown Prattville, Alabama! Snowdrift Farm Founder, Trina Wallace and her husband Bill will be our keynote speakers and guests for the 2009 ASA Meeting! We’re very excited! A veteran cold process soap, lotion maker and perfumist, Trina will talk about what it means to open and operate a body care or supply business: how and where to start, the responsibilities involved and how to feed the creative process. Bill will cover his view of the FDA Globalization act and the importance of creating and maintaining Cosmetic Good Manufacturing Practices (cGMPs). We promise fun, fellowship, food, education, and some awesome shopping opportunities. There will be several vendors there from whom you can buy on the spot, and many of our generous sponsors will provide samples of new products so we can try before we buy. Put this event on your calendar now…. it’ll be the *must attend* event of the summer of 2009! There are always several swaps that you can participate in. We promise you two fun-filled days of amazing demos. We have had amazingly generous sponsors who provide items for door prizes and for goodie bags. I’m sure that they will be even more generous in 2009. Some of our vendors may offer specials such as discounts and free delivery to the meeting. We’d love to see you there! Make plans now to be there, Friday, June 12th and Saturday, June 13th, 2009. Click HERE to register now! Early Bird Registration ends March 31!!! Wow that is sooooooo pretty! It’s too bad I’m on the east coast! it would take 683 miles and 11 hours to get there……maybe. i would so love to come and learn! maybe hubbie will say yes…. it is a pretty drive to alabama.